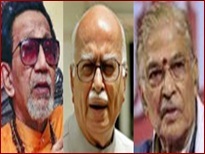 The Supreme Court asked BJP leaders L K Advani and Murli Manohar Joshi, Shiv Sena supremo Bal Thackeray and others to spell out their stands on a CBI plea for restoration of charges of hatching a criminal conspiracy to demolish the Babri Masjid in 1992 against them. A bench of justices V S Sirpurkar and T S Thakur sought to know their stands while issuing notices to them and asking them to file their replies within four weeks. The apex court issued the notices after Solicitor General Gopal Subramanium, appearing for the CBI, questioned the legality of the Allahabad High Court’s order last May, upholding a special CBI judge’s decision to quash the charges of criminal conspiracy against the leaders. The CBI has moved the apex court challenging the High Court’s 20th May 2010 order, dismissing the CBI plea for revival of criminal conspiracy charges against top BJP and Sangh Parivar leaders, which also included Ashok Singhal, Giriraj Kishore, Vinay Katiyar, Vishnu Hari Dalmiya, Sadhvi Rithambara and Mahant Avaidya Nath. The other leaders were former Madhya Pradesh Chief Minister Uma Bharti and former Uttar Pradesh Chief Minister Kalyan Singh. Challenging the High Court order, the CBI has said in its petition that “it appears an artificial distinction was made by the trial court attempting to assign a role in respect of each of the accused persons and to see which offences were made out. The trial court erroneously came to the conclusion that 21 persons were not entitled to be tried in the case (pertaining to the demolition on 6th December 1992). “The order passed by the High Court results in serious miscarriage of justice, violates the principle of consolidated investigation, consolidated charge sheet and also disables an effective trial,” the petition has said.